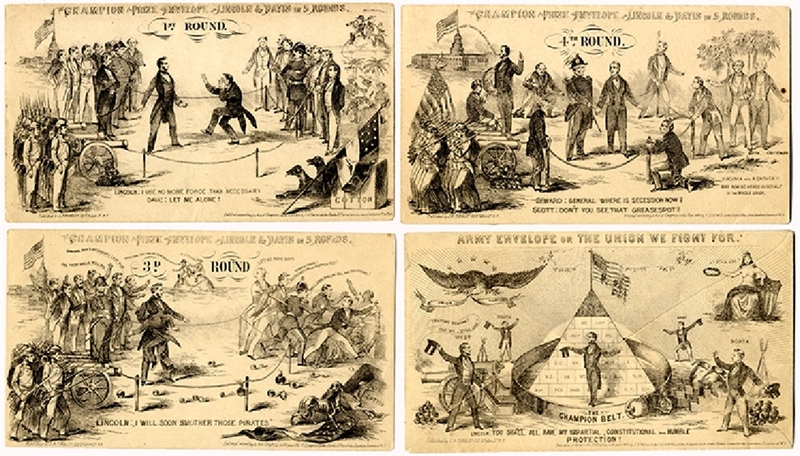 SET of 4 of 5 "CHAMPION PRIZE ENVELOPES - LINCOLN & DAVIS IN 5 ROUNDS" 1861. Only edition of this set. Each of these four envelopes represents one round of the Champion Prize Fight. The sub-titles have descriptions of all four events. The series starts with he 1st round with Lincoln and Davis in the ring with Union Soldiers on one side & Confederates opposite. Caption, “Lincoln: I use no more force than necessary. Davis Let me alone. Round two not present. ... plus, 3d Round shows the Confederates in retreat with Davis quoted “Damn Pickens, South Carolina and Sumter too!’ Lincoln still in the ring alone “I will soon smother those pirates”. ... 4th Round shows Lincoln and the Capitol, “I have taken the world by surprise”. Scott and Seward are in the ring, Seward “General where is the secession now?”. Scott replies, “Don’t you see that grease spot?” ... the final cover shows Lincoln in the center with the Championship Belt, “You shall have my impartial, Constitutional and Humble Protection”. The heraldic Eagle and Lady liberty are in the background. A pyramid of state stones in the background. VG.